Search advertising spend up 24% in Europe, with 38% in UK clicks coming from mobile. Quarterly search advertising spend is up by 24 per cent across EMEA, with revenue up by 23 per cent, research from Kenshoo has found. The research reveals the total volume of clicks on search ads rose by 11 per cent from Q2 in 2013, while total impressions have fallen by six per cent and click through rate is up by 17 per cent. Based on over 6,000 Kenshoo advertiser and agency profiles across all regions, the research found that in the UK, ads shown on mobile devices accounted for over a third (36 per cent) of all paid search spend in Q2 2014, with a CPC of €0.44 in Q2 of 2014, up from €0.31 in Q2 2013. “The increased share of spend and clicks taken by mobile could in part be due to the success of Google’s enhanced campaigns which simplifies the process of creating Google AdWords campaigns. Since migration to enhanced campaigns, search advertisers no longer have to run separate campaigns targeting desktops, tablets and mobiles – all devices can be served with ads within the same campaign, making it much easier to target mobile devices,” suggested Thorne. 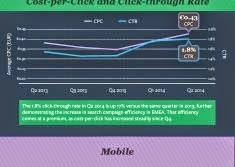 The UK also found that 38 per cent of all paid search clicks during the quarter came from mobile.